(Sanya, China - March 18, 2017) – Autograph Collection Hotels, part of Marriott International (NASDAQ: MAR), today announced the opening of The Shanhaitian Resort Sanya, Autograph Collection, marking the brand’s debut in China. The hotel joins the Collection’s ensemble of more than 100 strikingly independent properties around the world that are exactly like nothing else and share the brand’s values of vision, design and craft. This marks a milestone for the brand, as Autograph Collection Hotels continues to lengthen its lead as the fastest growing brand in its category. On track to reach 200 hotels in the next five years, Autograph Collection Hotels will expand its presence in Asia Pacific with upcoming openings in Indonesia, Malaysia, South Korea, China and the Philippines. Boasting a stunning backdrop of Luhuitou Park and the idyllic Dadonghai Bay, The Shanhaitian Resort Sanya exudes an understated, glamorous aesthetic with 199 guestrooms and 17 suites that seamlessly blend urban energy with a relaxed, resort atmosphere. Designed by the renowned Bangkok-based studio, P49 Design & Associates, the hotel’s design evokes the rhythm of water surrounding the locale. Fluid lines and curves are recurring motifs, echoing the mesmerizing movement and stillness of water. Contoured ceilings are reminiscent of the ripple patterns in the sand when the tide goes out, while dramatic glass chandeliers are symbolic of swimming schools of fish. The lighting panel is the centerpiece of the lobby, projecting water and moving images to enhance the energy of the space. 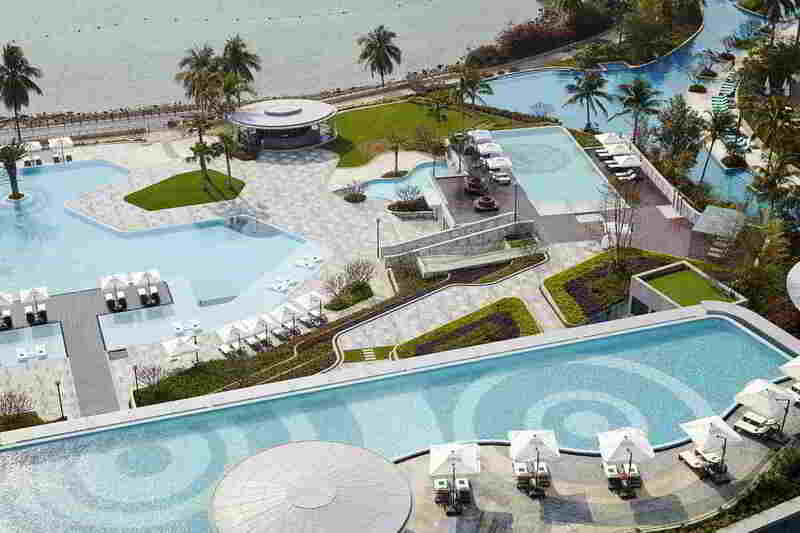 The Shanhaitian Resort Sanya offers guests five distinctive casual gastronomy and bar experiences. The Residence is the hotel’s signature restaurant, specializing in contemporary Chinese cuisine and showcases Cantonese favorites. The Reef is an all-day dining venue featuring international cuisine with locally-sourced ingredients and a “fresh-catch” seafood concept. Boasting breathtaking ocean views, The Pool Bar is the ideal spot for a refreshing drink and light bites, where guests can relax, unwind, and enjoy the natural scenery. The Lounge’s elegant décor of neutral tones offers a tranquil atmosphere and a traditional High Tea Menu. For guests looking to mingle with friends or indulge in a night cap, The Pod presents a curated cocktail program as well as delicious healthy drinks and smoothies served during the day. The resort’s third-floor recreational facilities, dubbed The Podium, feature specially-designed zones for well-being, relaxation and rejuvenation, fitness, nourishment and fun. Highlights include an infinity pool with unparalleled views of Dadonghai Bay; a state-of-the-art glass-walled gym with a heated sauna; a swim-up pool bar; and a spa with four deluxe ‘huts’ offering bespoke treatments. Equipped for both business and leisure travelers, the hotel features four recreational swimming pools and kids club as well as over 830 square meters of multi-functional meeting space to accommodate events of all sizes. With luxurious finishes and sophisticated design elements, the 500-square-meter pillar-less Grand Ballroom is an ideal setting for exclusive events as well. For further information about The Shanhaitian Resort Sanya visit: www.marriott.com/syxak, and for more information about Autograph Collection Hotels, visit: www.autographhotels.com.